One hundred and sixty-three days earlier, the Dodgers huddled inside the visitor’s clubhouse at Wrigley Field, commiserating over their second-round playoff defeat to the Chicago Cubs and pledging to advance beyond that stage in 2017. The front office shelled out nearly $200 million during the offseason to keep the team together. Throughout a mostly placid spring, the group exuded the calm of a club that knows the depth of its talent and the proximity of its dream. “It’s a quiet confidence,” said Justin Turner, one of the four free agents who re-signed over the winter, and one of the hitters who contributed to the Dodgers’ display of organizational might on the first day of their 60th season in Los Angeles, a 14-3 trouncing of the overmatched San Diego Padres. The team maintained its unbeaten record in Clayton Kershaw’s seven opening-day starts, although on this day, Kershaw acted as a supporting player to an overpowering offense before 53,701 fans at Dodger Stadium. The lineup set a franchise record for opening day with four home runs, including a grand slam from Joc Pederson and shots from each side of the plate by Yasmani Grandal. The Dodgers scored six runs in the first three innings, then six more in the next two. Eight members of the lineup crossed the plate. During seven low-stress innings, Kershaw allowed two hits and struck out eight. He allowed two runs, one unearned. He scored two himself. The summer will test the stability of the Dodgers rotation, the viability of their bullpen and the steadiness of their lineup. The fall will determine whether the championship drought ends or threatens to enter a fourth decade. But for one day, at least, the Padres served as a fodder for a fearsome unit. In the morning, with the temperature hovering in the low 60s, Manager Dave Roberts made batting practice optional, but most of his players streamed onto the field after 10 a.m., three hours before scheduled first pitch. He had intended to deliver a brief address to the group before the game. As he sensed the pulse of his players, he realized a motivational speech would waste everyone’s time. In his second year as the Dodgers’ manager, Roberts has learned the value of trusting his men to guide themselves through adversity. The team weathered an MLB record for players on the disabled list in 2016 to secure a fourth consecutive National League West title. This team, he believes, can handle choppy waters. So Roberts saw little reason to panic after Monday’s first inning, when a two-base throwing error by shortstop Corey Seager contributed to a Padres run. The Dodgers evened the score in the second after a double by Adrian Gonzalez, a single by Logan Forsythe and a sacrifice fly by Pederson. In the third inning, the gap between these two clubs became inescapable. To counter Kershaw, the Padres selected Jhoulys Chacin as their starting pitcher. Chacin had posted a 4.81 earned-run average with the Angels and Atlanta Braves last season, but for a team struggling through a rebuild, he passed muster for the season opener. Before the game began, Roberts said he expected to break into San Diego’s bullpen early. His premonition proved accurate: Chacin could not complete the fourth inning. The lineup overran Chacin in the third. The deluge began when Turner hit a two-out double. After two balls to Gonzalez, San Diego Manager Andy Green ordered an intentional walk. The move backfired when Chacin plunked Forsythe and loaded the bases for Pederson. Worried about pitching inside, Chacin fell behind in the count, 3-1. Forced to throw a strike, he delivered a fastball at the belt. Pederson’s hands were too quick. He scorched the ball into the right-field corner, a line drive that sizzled off the bat at 112 mph and cleared the fence. Pederson became the first Dodger to supply five runs batted in on opening day since Raul Mondesi drove in six runs in 1999. And Green stuck with Chacin. Three pitches later, he flipped a slider over the plate. Grandal blasted it toward the landing spot of Pederson’s slam. Few teams can boast an offense with this much brawn. Pederson swatted 25 homers in 2016. Grandal tied for the team lead with 27. Yet in this lineup they bat sixth and seventh, lengthening the minefield for opposing pitchers. An inning later, the Dodgers manufactured three runs on an RBI double by Turner and a pair of run-scoring wild pitches uncorked by Padres catcher-turned-reliever Christian Bethancourt. By the fifth inning, the only Dodger who hadn’t reached base was Seager. He came to bat with two runners on and two out. Bethancourt threw a fastball at the letters. Seager crushed a three-run homer. By the time Grandal unloaded his second homer, this one a two-run shot to left off a rookie named Jose Torres, a sizable portion of the crowd had departed the ballpark. There was nothing left for the Dodgers to prove on this day, against this opponent. A few minutes after 4 p.m., Roberts ambled into a news conference on the ground floor of the ballpark. There awaited his first serious challenge of the day: There was no chair behind his microphone. Roberts hoisted one up and carried it to his usual position. On this day, at least, not everything came easy. Shaking the sleep out of their old ballpark, awakening their urgency to end a title drought, the Dodgers majestically opened the 2017 baseball season Monday afternoon with a perfect two-part greeting. 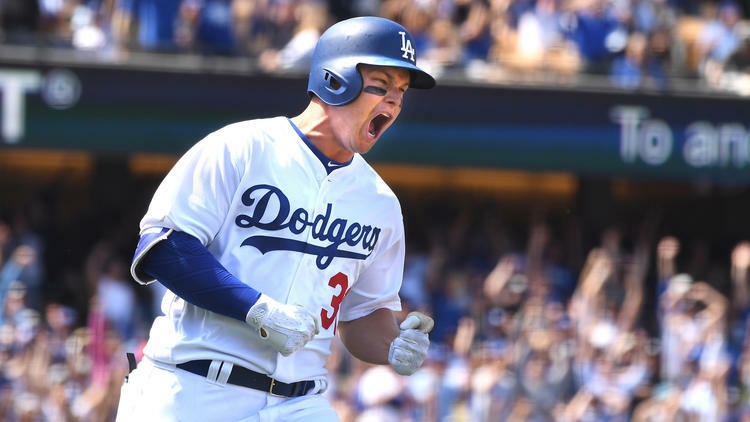 An hour into the opener against the San Diego Padres at Dodger Stadium, Joc Pederson hit a line drive that turned into a roar, hammering the ball into the right-field corner seats for a grand slam. Two minutes later, Yasmani Grandal cranked up the volume by lofting a ball over the same fence just beyond the same spot. Two innings later, Corey Seager turned Chavez Ravine into a dance party with a three-run homer into the left-field pavilion. Three innings after that, Grandal sent those fans bouncing to the exits in exhausted joy by driving a ball into the empty left-field Dodgers bullpen. The four home runs, a first in Dodgers’ history in an opener, quite possibly foreshadowed an unforgettable summer — struck on a day as cool as October but sunny with hope. “With our guys, every night something special could happen,’’ Dodgers manager Dave Roberts said, shaking his head and smiling after a 14-3 victory. Their opening-day bats were so special — every starter hit safely, Grandal homered from each side of the plate, Pederson had five runs batted in — it was easy to forget the Dodgers also benefited from the planet’s best arm. Yes, Clayton Kershaw pitched, and brilliantly, allowing just two hits in seven innings with eight strikeouts in remaining unbeaten in his seventh consecutive opening-day start. Even against a Padres team so young and untested that the entire roster combined will be paid less than Kershaw this season — $33 million to $28 million — it was a powerful first step for a team hoping to still be chugging in late autumn for the first time in 29 years. As usual, an afternoon of promise was framed with a bevy of memories, the Dodgers’ 60th opening day in Los Angeles marked by heroes present and missing. The ceremonial first pitches were thrown by former manager Tom Lasorda and former Coliseum hitting hero Wally Moon, and there was a clear message in their aging and regal presence: Between them, they own all five Los Angeles Dodgers world championship rings. Shortly before their pitches, the first video was narrated by the recently retired Vin Scully, missing his first season after 67 years but still taking the time to offer a homage to opening day. It was strange that Scully was absent from the booth and the media room, his distinctive voice available only through scoreboard video presentations. It was so strange that during the fifth inning, with the Dodgers leading 9-1, I sneaked away to the back of the press box to call him on his cellphone. Surely he was at home, watching the television breathlessly, calling the action from his couch, missing the game as badly as it missed him? Opening day at the carwash? So was he headed home to at least watch the end of the game? He was told the Dodgers. He was asked if he was happy. He then added, more seriously, that spending the afternoon living a normal life with his beloved wife Sandi was, for him, the perfect opening day. So are the Dodgers, who are beginning a mission that has been six months in the making. Judging by the calendar, Monday was a long way from the last time they played an official game, on that chilly Oct. 22 night in Chicago’s Wrigley Field when they were knocked out of the playoffs in Game 6 of the National League Championship Series. Yet judging from their internal clocks, it was only minutes. Bunkered in a tiny Wrigley clubhouse while a party raged around him last October, the Dodgers vowed to stick together and take that next step this season. Twenty-one of the 25 players in that clubhouse came back, a devoted group returning with such veteran focus that on Monday morning, Roberts didn’t even feel it necessary to give an opening-day pep talk. On the first day it counted, that spot was at the plate, on the mound, in the field and, perhaps most impressively, lodged somewhere over the fences. Four times. Farewell and welcome back. Joe Davis did not sleep through the night. He got his rest here and there, roused himself from bed, dressed in a Dodgers-blue blazer, and drove to Dodger Stadium to replace a legend. Never has Los Angeles known an opening day without Vin Scully. That sentence remains present tense, at least for this year. Scully was not in the broadcast booth Monday. He was not even on the premises, and yet he was everywhere. When Scully left the press box last year, he had to part a sea of adoring fans shouting his name and snapping photos on their cell phones. When Davis left the Vin Scully Press Box on Monday morning, the path was clear. First, to his right, Davis could see six framed posters of Scully, freshly hanging on a wall. Then, to his left, he could see a new display case that included the scorebook, notes and headset from Scully’s final broadcast, and a picture of President Obama presenting Scully with the Presidential Medal of Freedom. As Tommy Lasorda and Wally Moon took the field for the ceremonial first pitches, Scully appeared on the video board, narrating an ode to opening day, sharing memories of Moon hitting “Moon Shots” over the 40-foot fence in left field at the Coliseum and of Lasorda leading the Dodgers to their last two World Series championships, 29 and 36 years ago. Before Lasorda and Moon could throw a pitch, Scully extended a nod to Davis. So Davis did. Do what Scully says, and you’ll be all right. Davis called him a couple weeks ago. Scully shared stories of the Dodgers’ arrival in Los Angeles, and he counseled Davis to be his own man on the air, with his own style. But, when he asked about how Scully handled the biggest plays and the greatest moments, Davis must have listened. When Joc Pederson hit a grand slam for the Dodgers’ first home run this season, Davis kept his mouth shut and let the crowd and the camera tell the story, just as Scully would have done. “I treasure every opportunity I get to pick his brain,” Davis said before the game. Davis is 29. Scully, the greatest broadcaster in baseball history, was inducted into the Hall of Fame five years before Davis was born. Davis is not technically a rookie. He called most of the Dodgers’ road games last season, with Scully calling the home games. However, until Monday Davis had not called a regular-season game from the booth Scully had long called home. The Dodgers gave the booth a spiffy remodeling over the offseason, and Davis and partner Orel Hershiser showed off the new look to their viewers. “Mr. Scully, when he saw this, said, ‘Boy, that Joe Davis must have a lot of pull,’ ” joked Hershiser, who suggested the new work space might be so glamorous as to tempt Scully out of retirement. Truer words were never spoken, as anyone watching Monday’s broadcast would know. Davis delivers a clean broadcast. His preparation is evident, and he is not given to hyperbole. He works well with Hershiser, who can translate baseball jargon into English and who joyously noted Yasiel Puig’s bat flip on an intentional walk; and with Alanna Rizzo, the rare field reporter who adds substance to a broadcast. The production is superb; a shot that dissolved from a Clayton Kershaw delivery into a closeup of Sandy Koufax in the stands artfully bonded two generations of Dodgers history. And yet, we couldn’t help thinking there was something generic about it all. Scully was the last master of the one-man booth. He talked to us, not to a broadcast partner, regaling us with stories of ice skating with Jackie Robinson, and the history of beards, and did you know that Uggla was Swedish for owl? The Dodgers broadcast sounded good Monday, and at the same it sounded just like that of every other team. That old Joni Mitchell line came to mind — “Don't it always seem to go/That you don't know what you've got ‘til it’s gone” — except that all of Los Angeles knew what it had in Scully all along. It’s time for a different brand of Dodger baseball. 0 Response to "Dodgers deliver a message in opening-day thumping of Padres"